die okkulten mailänder gäb´s ja auch noch. planen ja eine tour für ende oktober/anfang november. 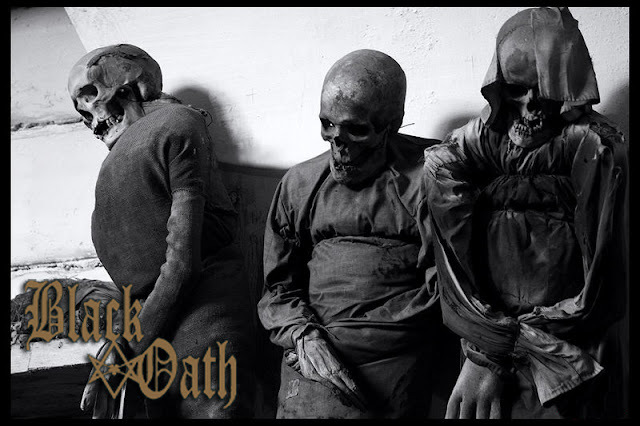 Black Oath hat geschrieben: THE RETURN ..
As already announced, the recording sessions for the new album are over. It is the most intense work the band ever made,it took two years since the last record and we are 666% satisfied of every single track. Heavy,occult and faster ,it is an esoteric journey which only the ones (who followed Black Oath album by album) can perceive ! A little anticipation will be online very soon .. Spread,share and warn the followers of the oath.. It will lead to damnation once again.. The shows of 24th April (Ita) & 13 July (Den) will be amongst the last ones for BLACK OATH. Maybe few more will be added but nothing sure, after that, the band will cease to exist for a long undefined period. No questions will be answered anymore. Na denn...schön wars mit euch!